Are Middle Slats Needed On Twin Bed Frames? Do I really need center support on a twin bed? My question is, are middle slats necessary on twin bed frames? Twin beds really are the perfect size and are often used for a multitude of applications. Some of us use them for our little ones and teens, while others use one for themselves, a spare bedroom, or even a vacation home. However, there is one thing all of these usage applications have in common. Unknowingly consumers don’t realize when they need middle support or a strong supporting bed frame with a middle that won’t let a boxspring sag, a common problem with ordinary wooden slats. Some of the best frames and center supports are not only reasonably priced, but will include a steel center support bar(s) with feet instead of wooden slats. Below we have explained in detail a few (Example 🙂 applications for single sized beds using center support. Research them or contact us with questions at 1 888 785 2337. Our F71001 from WSilver is special and is intended to replace either wood or steel side frames that have been lost or have broken. 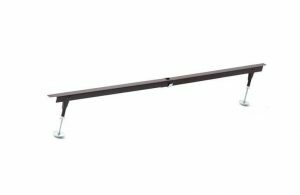 The heavy duty steel side rails extremely strong and hook in to the slots built within the bed legs. They are vertical running up and down the leg with two horizontal pins inside the slots. The steel side rails have two claws that hook over and engage the horizontal pins. This firmly secures the head and foot together for a beautiful finished look. consider lowering the frame height with a DRTF3.This unique frame does everything mentioned above with the 1 CS but also lowers the mattress and boxspring height so your bed will not be so tall. Additionally your headboard will have more visual appeal because more of it will be showing and not hidden by a modern thicker mattress. EXAMPLE 4: Frame with center support for twin metal or wood headboards only. Headboards for these beds are mostly decorative and usually do not carry any of the bed weight themselves and simply bolt up. Frames like the T13WB frame is built extra strong with 3 cross support bars that bolt into 1 ½ inch high carbon steel angle iron side rails. Each center bar includes two tubular steel legs and a total of 6 feet flat feet. This combination provides the maximum weight distribution and strength, so much so that this frame can not only support regular mattresses but also carry the weight of softside waterbeds and larger sized people. Our BB13WB is the exact same frame at the T13 but has footboard mounting brackets that bolt up to your wood or metal footboard. Why a twin frame with center support? All twin beds are not just used for children, adults use them also. Let’s face it kids are usually small, but they can be quite hard on beds and frames. Plopping, dropping, jumping, and wrestling bends and breaks frames which can be significantly more costly to fix than replace. Unfortunately when our heads are turned our little ladies and gentlemen forget the rules we put in place, which is the primary reason children are responsible for the largest portion of the replacement bed frame business. Adult usage requires big boy and big girl support. Better support and the additional weight that adults carry quickly wear out cut-rate frames. When sitting we concentrate our weight, and I admit it, sometimes even I plop into bed and goof off when the kids aren’t around. Know your twin bed and frame and consider how it is going to be used then plan accordingly. When we turn our heads kids will be rough on beds and let’s face it children get bigger and heavier with age and for a few extra dollars now and some planning ahead you too can be assured the next twin frame you purchase will not fall and your boxspring will not sag, warp, or fail with a little extra support. Baby Crib Conversion Kit Bed Rails Now Available!